The “Star Party” that was scheduled for last Friday evening at Hunewell Ranch Observatory was canceled due to a water leak and power outage. The sky-watching party is held every spring and fall. 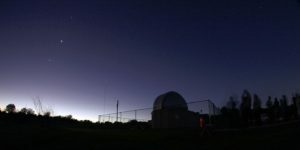 The original spring viewing was planned for March 24, but was cancelled because “the weather forecast was very uncertain with possibility of rain predicted,” said Program Director for Astronomy Education and Research, Dr. Shaukat Goderya. Rescheduled for March 31, the event was canceled a second time due to technical difficulties. According to Goderya, the power outage was caused by last week’s storms. “It usually takes a day before people can get to it and fix problems,” he said. Since it wasn’t known when the power would be restored, the party was canceled and a notification was placed on the observatory’s website. Some people still drove to the ranch east of Stephenville and found the gates locked. Regarding whether the event would be rescheduled, Goderya said the next star party will be held around the second or third week of October. Volunteer staff and helpers have other commitments for the rest of this semester, he added.